During the summer of 2011, I was a Graduate Student Fellow in Education Pioneers. I worked in the Special Education department of the San Francisco Unified Public School District. Part of my job was to prepare materials explaining SFUSD’s issue of racial disproportionality in special education. The other fellows in the program worked for education organizations all over the Bay Area. All of my fellow fellows were people passionate about education reform. They were former teachers, business people, law students and students of public policy. I was one of a few, however, that had really studied the causes and effects of inequality from an academic viewpoint. Despite my colleagues wide range of experiences, however, I found myself consistently frustrated that most of my colleagues did not seem to truly understand the systemic forces at play when it had to do with schools and reform. I found that many believed that black and poor parents didn’t care as much about their children’s education as their white or asian counterparts, or that the gaps we could see were the product of personal choices instead of cultural and structural influences. All summer long I longed to have a more informed conversation about inequality and oppression. I wanted to go beyond anecdote and discuss the research that folks had been doing for years that documented the inequality systematically. I wanted to explain some of the theories behind the opportunity gap. I wanted to have a conversation about what equality would actually look like. It was very disheartening that the people who were being primed to do the real work of reform didn’t know a lot about what they were working towards. Thankfully, one of my colleagues shared my frustration and arranged for me to facilitate a workshop about these issues. 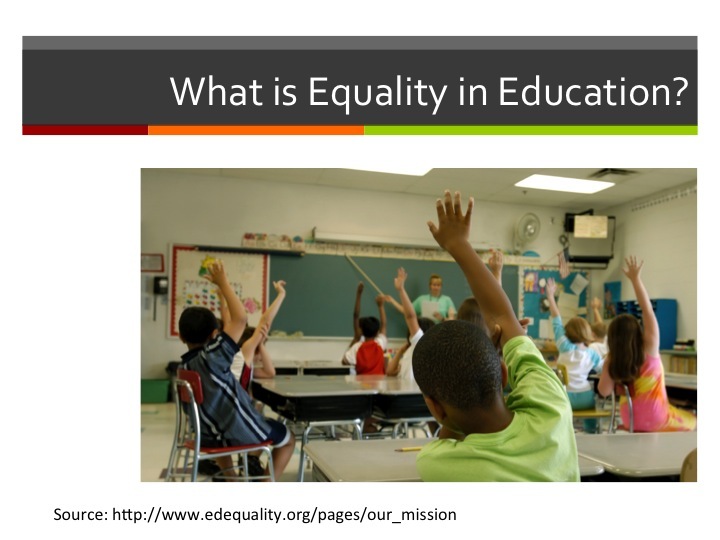 In the last week of the fellowship, I lead a discussion about inequality in schools, specifically around minority overrepresentation in special education. I think the shuttling of minority students into special education, segregated from non-disabled students, is one of the most pernicious forms of educational discrimination in schools today. The workshop was a huge success, with more than a quarter of fellows attending a non-required event on top of their regular workload. I think the workshop improved the ability of the fellows who attended to implement equitable policies as they go about their education reform work. Furthermore, as a result of the workshop, I was invited the next summer to help facilitate another conversation about diversity among education reform leaders. These organizations included the National Equity Project. This experience taught me that I actually knew things that are valuable to helping move forward the conversation about race, class, culture, and education among people actually doing the work on the ground.